Contact the Kindred – The Stetson Kindred of America, Inc. MEMBERSHIP: RENEWAL/DUES: Mail to William W. Stetson, 57 Forest Edge, Plymouth, MA 02360. E-mail: williamwstetson@aol.com. PRE-APPLICATIONS AND INQUIRIES: Contact Linda Brooks, 214 Musket Lane, Locust Grove, VA 22508. lbrooks46@yahoo.com. NEWSLETTER ARTICLES: Mail to Staci Kendrick-Jones, Editor, 385 S. Orchard Ave., Vacaville, CA 95688. StetsonKindredSpirit@gmail.com , or Linda Brooks, Co-Editor at lbrooks46@yahoo.com. GENEALOGY INQUIRIES: Barbara Merrick, 87 Elm Street, Halifax, MA. Hello, I was wondering if it would be possible to rent the space you have near the river for my wedding ceremony. The date is September 7th, and we would only be there for an hour or two. There will be about 170 people. If you could let me know that would be great. Yesterday I discovered my great-uncle was listed as a member of the Stetson Kindred in Vol. 6, page 144; Van Court, Benj. Potter…Detroit, Michigan. Through his sister (Carrie) and his mother (Hannah White Stetson) I obtained my DAR membership. I am delighted to learn of the Stetson Kindred and that this still exists. Would I be able to join using Benjamin’s application and showing my relation to him? I too come through the Van Court line. For your DAR membership did you find a marriage license/certificate Hannah and Benj. Potter Van Court? It was always something my Nana tried to obtain and didn’t. Hannah was my grandfather’s grandmother. How many greats is that? Jennifer, My message to your yahoo email failed to deliver. Please contact me again with a better email address. Been waiting to find others from VC line. Yes, I have mc. If you are trying to get into DAR some of my information may help you. I am in high desert of Southern California north of Los Angeles. Is this the Jennifer Heiss who is now on SKOA Board of Directors? I’ve been trying to locate you, your email was invalid. Please, please contact me re:Van Court line. Your grandfather who was his parent? I am wondering if the annual reunion still takes place in Massachusetts. If so, where do I get information on the dates, etc? I also believe I saw a report that the (or a) early family property had been sold/burned? Can you direct me to more on that? We would like to at least come and see the site if possible. Most certainly, the Stetson Kindred meets at the Kindred Homestead in Norwell, MA., the third Sunday in August of each year. Information will appear on this web-site as plans are formulated for 2014. The original homestead house is not longer in existence but we continue to maintain the property and it is possible that arrangement could be made for you to visit the same when you are in the area. We would like to learn more about your lineage and assign you a rightful place on the family tree. How has life treated you? Have not heard from the Kindred for several years. Did you take us off your list? Note New address. Thank you for letting us know that your address has changed, will update our listing. Wonder of wonders, I do remember the entire Conrad family coming to the reunion and it is nice to have contact with you again. I will ask our archivist to try to locate the photo you are requesting. It should be in one of the 1991 or 1992 Newsletters. I’ve been to a couple of the reunions; both in the 80’s, I think. I let my memb. lapse and don’t get the newsletter anymore. I just discovered the FB page and requested memb. there. I would like to get the newsletter again. Cornet, Robert, Isaac, Nathaniel, Nathaniel, Nathaniel, Osman P., Sidney S., William S.
I will send you the current membership information, welcome back! I am descended from Cornet Robert Stetson, Thomas, Elisha, Egloth (who m. Ephraim Washburn). I am also descended from 3 branches of Stevens’, one of which is descendant of the Stetsons’. I didn’t know there was a yearly family reunion or a newsletter. Very interesting! A check of our membership records find that the only line ever registered through Egloth (Stetson) Washburn contnued through his daughter Elizabeth/Betsey and her daughter Abigail (Drew) Sampson. The Kindred would assist you to develop your lineage if you were to send back and outline of the names of the descendants down through yourself. With the Washburn surname it is possible you have a Mayflower connection. If your father wasRobert Steele Stetson, born in 1919,and his father married to Lottie Steele, many of your cousins are members of the Kindred. We have a lot of your ancestor lineage in our files and will be happy to share this with you. Please give us a bit more information on your father, such as birth, marriage and your own data so that the file can be upgraded. Cornet Robert Stetson is my 9th great grandfather. His son Joseph Stetson is my 8th great grandfather. Joseph Stetson’s daughter, Lois Stetson, is my 7th great grandmother and then from there it goes through the Ford family. I just came across this website while doing some family research. I am from Oklahoma so I do not know if I will ever make it to a reunion but it is nice to know there is one. Just wondering if anyone has any pictures of Lois Stetson-Ford, Joseph Stetson, Cornet Stetson, Thomas Stetson? Unfortunately there are no pictures of any of the early generations of the Kindred as they lived long before the camera was invented. The Kindred would be most interested in knowing the names of the individuals to complete your line, as we have run very few lines through the,Ford descendants . Would be able to forward them to us so that sketches of these descendants can be worked up for future usage? A copy of what is developed would be shared with you and upgraded when or where necessary. Thank you for you consideration of this matter. The children of Ephraim & Egloth Stetson that I have are: Ezekiel, Deborah, mercy, Ephraim, Alithea, Eunice (my line. She m. Elijah Chandler Stevens), Nehemiah, Sarah. I do not have a Betsy/Elizabeth or Abigain Drew Sampson. What exactly do you want me to send to you? You may be able to see my lines if you go to my brother’s, John Stevens, tree (John’s Tree1). We share the tree on line. I also have that Elisha Stetson m. Abigail Brewster. Please give me a more direct request of what you want me to send to you. Thanks for responding to my note. I would like to look at John’s tree but do not know under which program to look. Suggest you send program name using my private email address of Stetsongenealogy@yahoo.com rather than this forum. My community has AV Wall The Mobile Vietnam Veterans Memorial for the Antelope Valley through November 11th until 11 pm. On the wall I found Kenneth Earl Stetson from Longmont, Colorado, LCPL Marine Corps Casualty Date 02/17/68. Did anyone know of him? Yesterday unstuffing my PO box of several days mail was the Fall Kindred Spirit. What a wonderful surprise to read the article with photo on Jesse Stetson, the last sentence “SK has counted several of Jesse’s progeny among its members”…of which I am the most recent! And last night my local genealogy club met, theme being Show&Tell; I already planned to announce my official SKOA membership, this page was a perfect, timely addition. And, a DAR friend who recently joined the War of 1812 Society had talked with me to look into it. She was thrilled when called her this morning and read of Jesse’s 1812 service. My DAR is through his wife Amy’s grandfather. Greetings, I am happy to have found this newsletter and group. I am a tour guide for the absolutely fabulous Stetson Mansion in Deland, Florida. We were named the most popular attraction in all of Florida last year and we still hold the title. TripAdvisor the world’s largest travel site named us by calculation an internal algorithm for number of reviews not by visitors to the mansion as we give daily tours of this magnificent gilded age totally and elegantly restored home. It was built for John B. Stetson as a winter home for he and his family in 1886. I would love to be able to get an entire genealogy chart emailed to me if anyone can supply one. Please check us out at http://www.stetsonmansion.com and by liking our Stetson Mansion FaceBook page. Thankyou for your help. The Stetson family is so large that there is not a genealogical chart available which is of a size large enough to show John B.’s entire family. We could, however, provide a small version…and yes, we have checked out the internet material on the mansion, which will be the topic subject by Bev. Colton-Cochrane, at the Annual Saturday Dinner Meeting on August 15 this year. I am writing from St George’s church, Modbury, Devon in England where Cornet Robert Stetson was born 400 years ago. We are going to do a display in the church to commemorate this event and if any has anything tof interest we would be very happy to include this. Thank you. I note from photos sent by Rev. Barker that you were able to arrange a tasteful display to honor our ancestor Cornet Robert. Thank you for your efforts. We appreciate all your artistic work. You are very welcome, I really enjoyed the project. Robert was quite an interesting man, and achieved so much. Unfortunately I was unable to attend on Sunday, but I have a photograph of The 13th Annual Stetson Family Reunion on August 18, 1917. I was wondering if any of the kindred would like a copy of the photo? Yes, please. I know my granduncle was in SKOA in 1923; maybe he was at this 1917 event. We would love to have a copy of it, are the people identified in the picture? I seemed to have misplaced my dues envelope. I am wondering if you could please send me another one. Also I seem to remember that my dues were not current, with the last payment in 2013. However I have sent in two checks for membership. Check (5317) was sent on 03-21-14 for $10.00 and check (5431) was sent on 02-01-15 for $15.00. Would you please check on this and also please let me know what amount I should be paying for dues. Thank-you in advance. i HAVE FORWARDED YOUR EMAIL TO THE TREASURER, JUDY GRECCO,. SHE SHOULD REPLY TO YOU. I tried sending you an e-mail but it came back. I tried again today to send it to the archivist in hopes she would respond. I’m writing for a family whose matriarch once belonged to the Kindred – I’m attempting to finish the Stetson genealogy she started several years ago – I hit a wall and can’t seem to get beyond it. Hopefully, the Kindred may have resolved the issue I’m having. Since my friend, Mary Panus, was once a member and officer of the Kindred, she must have been a true Stetson descendant. Mary is now deceased, so I hope I can finish her work for her family. Having found this message, I will contact you at your email address with copies of application. I am 11th generation descended from Cornet Robert Steson. I am interested in attending a reunion. Please send me the schedule for the next reunion. Delighted to learn of your ancestry through William and Priscilla (Stetson) Whiting and would like to learn more about your line. The Kindred meets on the homestead property in Norwell, MA on the third Sunday in August of each year. We would love to have you attend and meet your cousins! Hi. 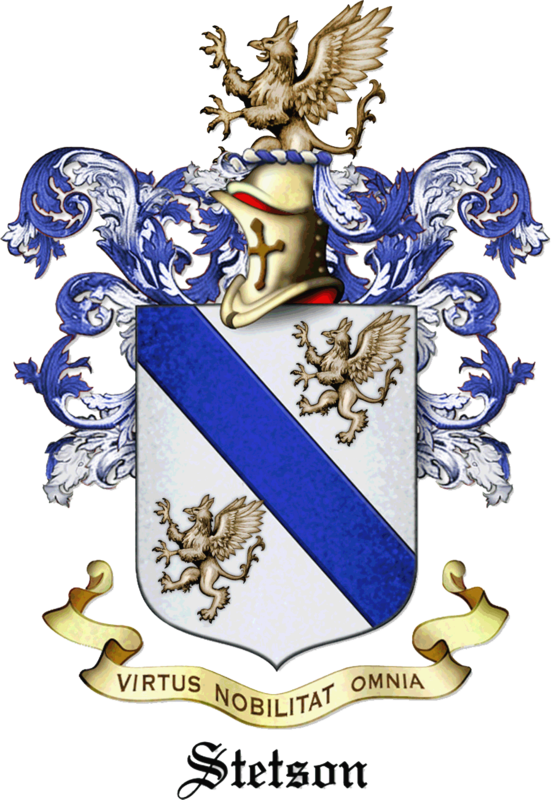 I am an 11th generation descendant from from Cornet Robert. I believe the line is Cornet Robert>Joseph Stetson>Robert Stetson>Amos Stetson>Gideon Stetson>Abel Stetson>Abel Columbus Stetson>Willie Stetson>Edwin Stetson>Leah Stetson (my mother). Is there any way that you can help me confirm this? My mom was a SKOA member for years and, having lived in Scituate, MA, attended a number of annual gatherings. I seem to remember going to one when I was very young. Any help you can provide is greatly appreciated. Thanks. Most certainly your mother was a member and her number was 1491. Her genealogy has been published in Volume 4 and she included info on your father, Harold, your marriage to Lynne and your 3 children in the material which she gave to the KIndred so that the line would be well recorded. Hope that you can make another reunion and meet with your cousins. I am iinterested in participating in a Stetson dna project. Is. there one peesently active? I am a member of the Butler Family dna project, and am connected to a small group Ra1a1a sbset in that group. I am descended from the elusive dr. Jennet Stutson b.1803 Scituate, MA of unknown parents as were bro James and sister Sophia. They moved to Baltimore, MD and then to. West Jefferson, OH. JS fathered 11 children and was quite accomplished in his lifetime. I correspond with Barbara Merrick occasionally and appreciate her exchanges. In spite of uncertain lineage I keep my Assoc Membership active. I am a SAR, SR & Soc of Colonial Wars member. Hi Robert, I’ve uploaded my DNA results from both ancestryDNA and 23andMe to GEDMatch.com. My numbers are A755024 and M232689. My mother, also a Stetson is A952312 and our Haplogroup is U2e2. guests for the Kindred Dinner Saturday night and event for Sunday. Phone – 305-804-3324 (c) – 305-971-1044 (o). If not, I can send by mail today or bring check to dinner Sat night. We will be staying @ a motel in/near Plymouth. I am flying up Friday, my wife and her sister are arriving by car on a genealogy trip in eastern U S. We do not need lobster if it is an issue with the caterer. Thanks for your help. We were so occupied with reunion preparations that we did not check this website and missed your eamil, HOWEVER,since you were at the meeting, I know that you didn’t miss having an answer. I am planning an East Coast Stetson Family tour for a group of Stetson Cousins of California next October 2017. We are descendents of Cornet Robert>Joseph>Robert>Anthony>Ezra>Benjamin>Jesse>Dr. Benjamin. Whom should I contact to arrange entrance to the Shrine? And what is the best way to purchase copies of the Stetson Genealogy Books? Our California reunion will be held October 15, 2015 in Elk Grove, California. If possible, I’d love to have this information prior to our reunion. Thanks! I am a California Stetson Cousin; we split at Jesse, his daughter Hannah where you are Dr. Benjamin. Curious where you live in California, I am in northern LA County. I am in Vacaville between Napa and Sacramento. There are many other Stetsons in Northern California who are descendants of Jesse Stetson of Sangerfield, New York. In fact we will be traveling to Sangerfield after a cruise from Quebec to NY and prior to our visit to the Stetson Shrine next October 2017. Please email me at Staci@SuiteRomanceTravel.com if you are interested in more information about joining us. Hi Betsy. I’ve been looking everywhere for your email address. I thought I had it somewhere. Please contact me at staciken@gmail.com. Thanks! Judy Grecco would be your contact for access to the Shrine; she is at judy216@verizon.net. Emilie Green could tell you what books are available for purchase; she is at Emiliebgreen@mac.com. You might also enjoy a tour of the Stetson House in Norwell; Judy could also help you with that. Thank you, Linda. Judy has very kindly sent me lots of great information and Emilie has indicated which publications are available. I’m just waiting on instructions for how to finalize the transaction. Can’t wait to get those Stetson books in my Family Genealogy Library! I’m wondering if there is a cache of back copies of the Kindred Spirit newlsetters available for viewing on line by SKOA members. I would love to see them, especially if the Modbury church display photos are included from 2015. Thanks. Perfect! I loved reading them and have an article to submit for the Spring edition. Thanks, Tim, for posting the Fall edition of our newsletter. It will give cousins everywhere a chance to see photos from the enjoyable annual meeting we held last August in Norwell, MA. I am working on the genealogy for my family. I believe I’ve traced the family tree back to Cornet Robert Stetson. My father was Cloyce Leroy Stetson. His father was Cloyce Leroy Stetson. My grandfather’s father was Horton or Horten Guy Stetson. His father was Alonzo Whitfield Stetson. Alonzo Whitfield Stetson’s father was Thomas Stetson (married to Maria Mallick or Malick). Thomas Stetson’s father was Briggs Stetson (married to Dolly Fuller). Briggs Stetson’s father was Thomas Stetson (married to Nancy Briggs). Thomas Stetson’s father was Thomas Stetson (married to Mary Hall). His father was Cornelius Stetson (married to Thankful Saunders). Cornelius Stetson’s father was Isaac Stetson (married to Elizabeth Stetson). Isaac Stetson’s father was Robert Stetson II, the son of Cornet Robert Stetson. I was wondering if it would be possible to become a member of the organization. My father owned a copy of a book about Cornet Robert Stetson. I was also wondering if I could purchase a copy of it. Most certainly you would be welcome to join the Kindred. For additional information please contact me through email address listed above. I’m working on my Mayflower Society application and received a rejection letter from the California society today. It seems they do not recognize Hannah Tilden b. 14 Oct. 1662 “unless she is the Hannah who d. Scituate 13 May 1710.” They want me to submit “primary proof. Is there such a thing? She is listed as the first child of Stephen Tilden and Hannah Little in the Richard Warren line, but her marriage to William Stephens has a question mark after her surname in the listing of New England Marriages prior to 1700, Torry, Clarence A., Baltimore, MD, USA: Genealogical Publishing Co., 2004. Hannah Tilden and William Stephens were the parents of Hannah Stephens who was Ezra Stetson’s mother and father in-law. Ezra (b. 22 Sep 1729) (Cornet Robert – Joseph – Robert – Anthony) was married to Sarah Rider, the daughter of Hannah Stephens and Benjamin Rider (Ryder). Has anyone got any information on where I should re-focus my search back to the Mayflower? Thanks! I am trying to find a picture of my grandfather, Donald Truman Stetson . Any help or direction you can offer would be greatly appreciated. Seeking personal & military history of Isaiah Stetson, b. 1750; reported dead in 1798 in West Indies. “Capt. Isaiah Stetson, great grandson of Robert of Pembroke, was born July 10, 1750, son of John and Deborah (Tower) Stetson; he was a most energetic and brilliant sea captain who during the early part of the Revolution was engaged in Privateering expeditions and a large silver spoon in my possession came from one of the captured ships. January 1, 1777 to April 13, 1780 he was in land service and commissioned as Captain in Col. Gamaliel Bradford’s 14th Regiment residence Pembroke, and engaged for the town of Pembroke, mustered by County and Continental Muster Master. July 1778 he was on the muster-roll of field, staff and commissioned officers, dated White Plains and again April 1779, dated West Point, and September 22, 1779 was reported “now in the field.” He was Captain in this same 14th Massachusetts Regiment and on a list of settlement of rank of Continental Officers dated West Point made by a board held for the purpose, and confirmed by Congress September 6, 1779. Commissioned January 1, 1777. Captain Stetson, after the Revolution, returned to the sea and was lost on one of his voyages. The census of 1790 counted Isaiah Stetson and 3 unnamed others. This presence, and supporting his growing family would have brought him home after service from the privateer Rattlesnake and his capture by the British in1781. What was he doing later, such as Masonic activities, ships he was on and where, before his reported death the West Indies in 1798? Was a list of vessels built by the Stetsons written in Stetson Kindred Booklet No.3, pages 9 and 10? When is the next meeting and what is the cost ? Are you ready? The big weekend starts on Saturday, the 19th. Members gather at 5:00 PM at the Church Hill Methodist Church, located at the corner of River Street and Stetson Road for a delightful dinner at 5:30 prepared by Fork In The Road Catering, followed by a talk by a guest speaker. On Sunday morning, the 20th we’ll start out with coffee and pastries at the Pavilion at 9:00 AM. Registration and welcoming continue until 10:00 when Kelli Barlow Dean will have kid’s games available. Then at 11:00 we’ll have the annual group photo in front of the Pavilion, and then at 11:15, the call of “Clam Chowder Time” is sounded, followed by the Clambake at 12:00. The Annual Meeting is set for 1:30 – or as soon as the lunch is over. And who could pass up that Clambake for $37 (incl tax+tip) – no cost increase this year! Corn-on-the-Cob, Red Bliss Potato Salad, Homemade Cole Slaw, Corn Bread & Butter, and Strawberry Shortcake with Homemade Whipped Cream for dessert. And all for only $37.00 per Person (incl. tax & tip)! We hope that you will be one of our relatives or guests who is attending the 112th Reunion. Reservation forms for the annual meeting’s lobster dinner will be sent out in the Call on July 15th. Please try to get your reservation in by August 13th so we can finalize plans. Sorry, I cannot travel any more due to combined effects of aging; I am now 85-1/2 but still counting. Still trying to trace Isaiah Stetson who was 1st Lieutenant of Massachusetts privateer Rattlesnake in 1781: what happened to him after that date?Can someone help? I am the great-granddaughter of Alvin Phillips and Minerva Pierce Phillips. I believe that makes Cornet Robert Stenson and Honour Tucker my 8-great grandparents. I am fascinated with my family’s history and would like to learn more. I am interested in learning more about your organization. I was reviewing my DNA matches on Ancestry and a 4th cousin appeared with the last name….Phillips. It may be coincidental since I just read your message but I found this interesting. I am the granddaughter of Donald Truman Stetson. Where on your family tree is an ancestor, Isaiah Stetson? I am trying to track his activities from 1790 through 1798. Your project is interesting and we do hope that members will participate, However I note that the Stetson Kindred has no record of your lineage and we would be pleased to be able to add your data to our ever growing collection of over 13,000 lines from Cornet Robert and Honour (Tucker) Stetson. If you descend through Vincent, your data would initiate a start of collection under his descendants.. Readily available through the Stetson Store from this website Contact Emilie Green.